American Legion Dept of NY 6th District Vice Commander Bradd Vickers a Vietnam War Veteran left meets with United States Vice Chairman of the Joint Chiefs of Staff Admiral Edmund P. Giambastiani, Jr., during a Veterans Recognition Ceremony at Oneida Nations Shenendoah Golf Club in Verona, NY. Joints Chiefs of Staff vice chair urges support for military. Recognizing all our Veterans, as we solemnly approach another Veterans’ Day in a nation at war, Navy Admiral Edmund P. Giambastiani Jr., a Canastota, NY native, told a group of local veterans, that it's their duty to personally thank young military service members for the work they're doing abroad. “For our great Nation to remain great, it needs the services of talented, brave and dedicated men and women who answer the call to colors. And they, your sons and daughters, will do that only with your support and encouragement. 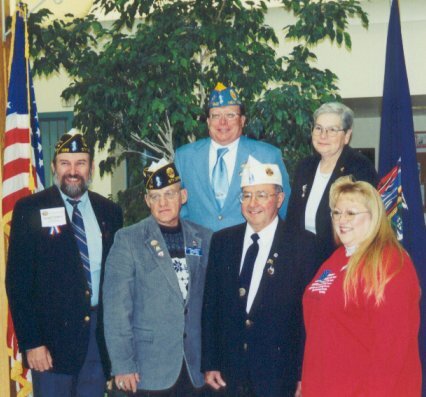 When you do that, you make the faith of a nation real”, Giambastiani said during a veteran recognition breakfast organized by the Oneida Indian Nation and attended by representatives from American Legion and Veterans of Foreign Wars throughout Madison Chenango and Oneida counties. Giambastiani is vice chairman of the Joint Chiefs of Staff and the nation's second-highest-ranking military officer. “All told”, he said, “190,000 American Indians have served in American wars.” The admiral also cited the role of Oneida Indians in helping the Americans win the Revolutionary War and overcome the most powerful nation on earth at that time. The Oneidas were also among the 18 "code talker" tribes whose enlisted men were used to transmit messages by radio during World War II to stymie enemy code breakers. 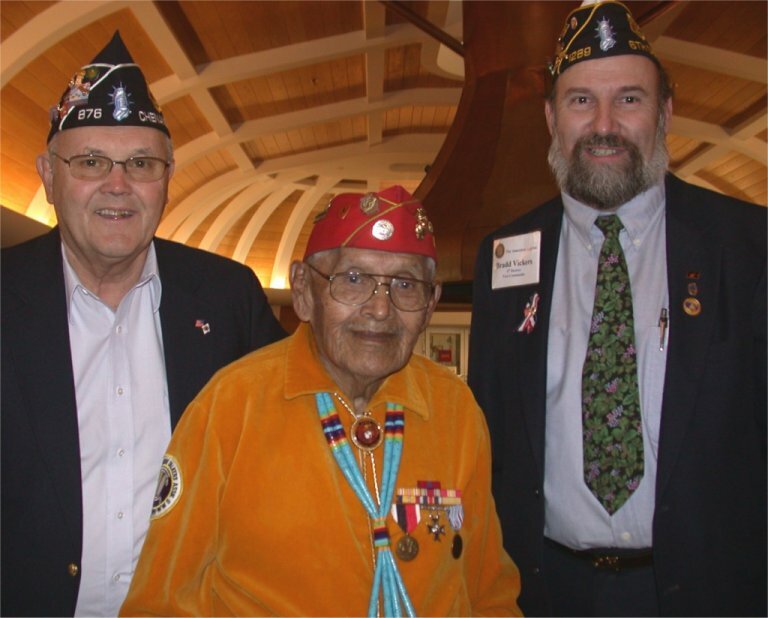 American Legion Dept of NY 6th District Vice Commander Bradd Vickers and past Chenango County American Legion Commander Frederick A. Baker had the opportunity to hear Merril L. Sandoval a "code talker" speak at last years event. Vickers said “Admiral Edmund P. Giambastiani Jr., is a very personable and sincere individual.” Baker said both he and his wife Judy, an American Legion Auxiliary member were honored to attend such an event. Giambastiani went on to say, "We're engaged in a war with violent extremists that follow no laws. They wear no uniforms, and they defend no borders. Don't think for a minute that they wouldn't use a biological weapon or a nuclear weapon if they could get their hands on one. Here in New York State, you are familiar with the courage, commitment, valor and fidelity of our men and women in uniform. They are also your neighbors, your co-workers, your children, your friends and your family. They represent the best and the brightest our Nation has to offer. They have higher rates of education and aptitude than the American population at large when we recruit them into your military. And they are held to higher standards of physical fitness, morality and ethics – and they meet and exceed those standards throughout their military careers. And we need men and women of their valor and intelligence and dedication, because your military is more engaged, in more places, accomplishing more, and more different, missions than at any single time in my career in uniform”. 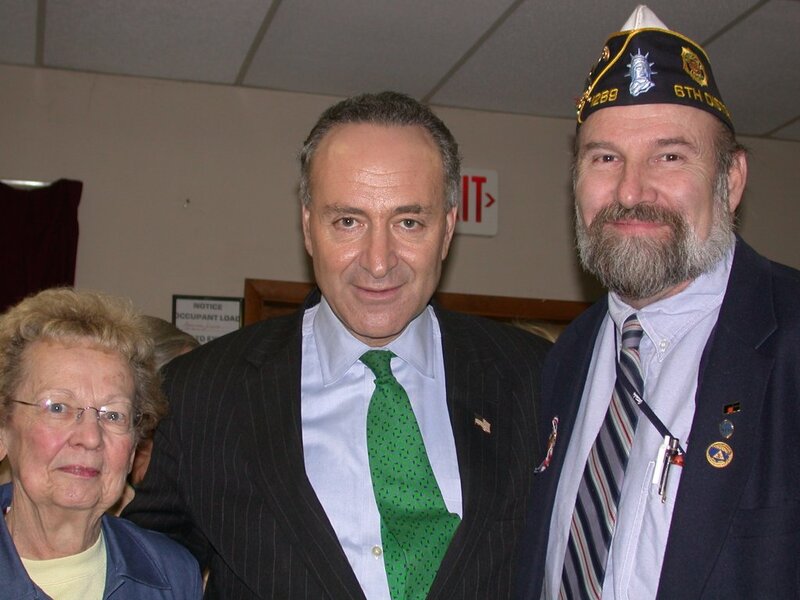 We greatly lament the loss of a close friend and supporter of the American Legion, and Post 189 Commander, Mayor Bob Raphael (left), who went to a higher calling on Memorial Day. We shared the grief with his family, as we remembered some of Bob’s days on the farm that shaped his high moral standards and his exceptional humor. He will be greatly missed. Thanks to Sidney Post for providing the space for a meeting with Chenango County Legislative Chair Bradd Vickers and Senator Schumer. Many pertinent issues were addressed with over 60 people in attendance at the meeting. the outcome of World War II. American Legion Dept. of NY 6th District Vice Commander Bradd Vickers and Chenango County American Legion Commander Frederick Baker were among 200 people, many of them U.S. veterans, who received special invitations to hear Merril L. Sandoval speak at the Oneida Indian Nation's Ray Elm Children and Elders Center in Oneida. He spoke about his experiences in World War II and the coded language he was trained to use. Merril L. Sandoval was a "code talker" for the United States Marine Corps during World War II. He and other Navajo Indians used a form of coded speech that relied heavily on the Navajo language to relay messages from military superiors to units on the battlefield during the war. Born in New Mexico in 1925, Sandoval attended the Farmington Mission School in the 1930s, where he was forced to learn English. "Any time we got caught talked Navajo to each other we were punished," he said his teacher's attempts to rid him and his classmates of their native tongue. "But we still had our language, as much as they tried to take our language away." Fortunately Sandoval did not forget how to speak his native language, Navajo, when he was forced to learn English in school. That's because the language he grew up speaking on the eastern Navajo reservation in New Mexico played an important role in World War II. He mentioned during the speech his belief that the Navajo people must keep their language alive, and pass it onto their children and grandchildren, you never know when the language will become helpful again. In 1943, he enlisted. After attending boot camp in San Diego, Merril was transferred to Camp Pendleton to be further trained at the Radio Communication School where he trained to be a code talker, as were many other fellow Navajo Marines. Merril served with the 2nd and 5thMarine Division in the Hawaiian Islands, Saipan, Iwo Jima, and occupation of Japan. While there were over 400 code talkers during World War II, Sandoval said there are now fewer than 100 left. Often during the speech, which was accompanied by a slide show of photos taken during the war, he would point out fellow code talkers who have since passed away. The youngest of the remaining code talkers is 79, just one year younger than Sandoval at 80. As portrayed in the 2002 movie "Windtalkers" Navajo code talkers used their native language to relay messages in a code that the Japanese military never figured out. Sandoval also expressed his views on the movie about his fellow Navajo Marines, which he says is not completely accurate. The studio that made the movie, MGM, asked permission to make the film from the Navajo Code Talkers' Association, of which Sandoval is a member. The Association suggested changes to the movie, but the studio ignored their suggestions. Sandoval said the Japanese intelligence officers attempting to crack the language. "It was real fast and it was real secret." "They tried every way to decode our language, to decipher it." The Japanese, he said, were always trying to disrupt the messages though. They would say things in English to try to confuse the Navajos. "If I'm sending a message I knew they were listening," he said, but added that the Japanese tactics rarely worked. "We knew each other so well; we knew each other's voices." Relaying the messages in code, Sandoval explained, was more complex than simply saying the message in the Navajo language. To spell out the names of places they used words for animals. The letter "A" became "wol-la-chee," the name for an ant in Navajo, while "B" was "shush," the Navajo word for bear. They would mix it up though too. When spelling out a long name like Guadalcanal, they would occasionally substitute the Navajo words for ax or apple when they wanted to say "A," instead of simply using ant all the time. The words for different types of boats and planes all got Navajo names as well. Since they referred to different types of planes by calling them different kinds of birds, the name for an aircraft carrier became the Navajo way to say "bird carrier." To make it even more complex, Sandoval explained to the audience, they often used different combinations of Navajo words to denote single English words. For example, the English word "secured" was said by using a combination of the Navajo words for "illness" and "cured,” because "secured" sounds like "sick cured." Using this complex code, Sandoval relayed messages from his Marine division to Navajo Marines stationed with military officials in other parts of the world. The message would be given to him in English on a piece of paper, relayed and received on the other end in Navajo, and then translated and delivered to military officials in the other location. Sandoval talked about his involvement in the battle for Iwo Jima, which he recalled with sadness. Everyday he had to relay messages about the number of Marines killed or wounded, and he said they lost over 2,000 soldiers in the first hours and 6,000 soldiers in the three weeks it took to conquer the small island. When the job was done though, he spoke of his fellow troops excitement when a small group of soldiers raised the American flag on the island, a moment immortalized in photography and statue. "They were glad to see that flag up there," he said. "It meant a lot to us even though we knew it was no victory." At the end of his speech, Sandoval commended the other veterans in the room for their work in protecting the country as well. Vickers noted "We can be thankful the Navajo language survived, perhaps saving thousands of lives and preventing a far different ending to the war." at the Chenango County fair. 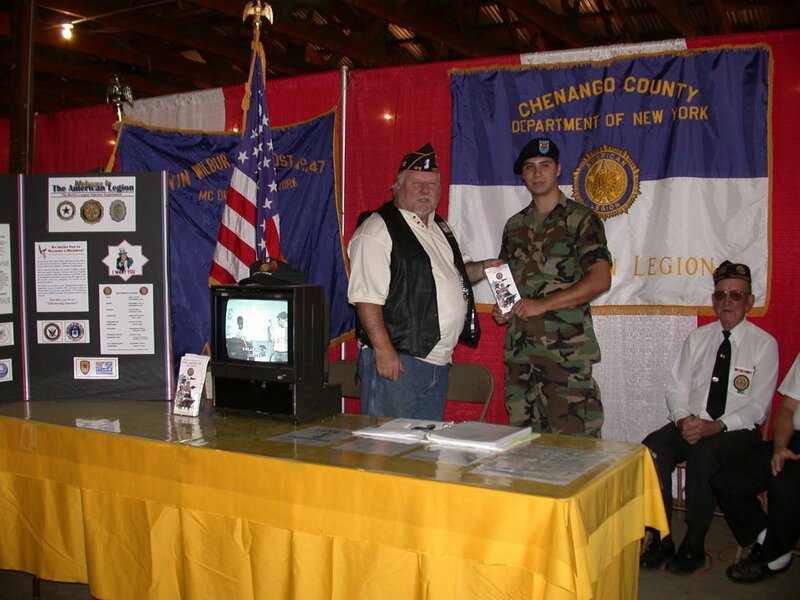 SHERBURNE - A 20-year-old criminal justice student from McDonough was awarded the 2003 Frank J. Benenati Scholarship at the annual Chenango County American Legion convention here Sunday. Catherine Suloff, daughter of Mr. and Mrs. Herbert C. Suloff, was presented with the $500 award by former sheriff and state trooper Joseph J. Benenati of Norwich, Frank Benenati's brother, and A.J. Black of Post 1289, South New Berlin, Law & Order Chairman of the county American Legion. Miss Suloff holds an A.A.S. degree in Social Science from SUNY Morrisville and is a 2000 graduate of Oxford Academy. She currently is a junior at Binghamton University and is looking forward to a career with the New York State Police. The annual law enforcement scholarship honors Frank J. Benenati of Norwich, who died 27 February 1953 near Panmunjom, Korea, while attempting to rescue a fellow Marine. He was a member of the Recon Company of the 1st Marine Division, and he envisioned a career in the state police with his older brother after the war. Joseph Benenati, Post 189, Norwich, had a scrapbook detailing events in his brother's short life, which he shared with Miss Suloff and Legionnaires following the convention. The scholarship was developed by the late Lee Campbell, a former County Commander and Law & Order Chairman of the American Legion, about 10 years ago. It generally is awarded annually. The scholarship is funded by the County American Legion and by donations. Individuals wishing to donate to the program can send checks to Bradd Vickers, County Legion Treasurer; 1028 County Route 19; Norwich 13815. 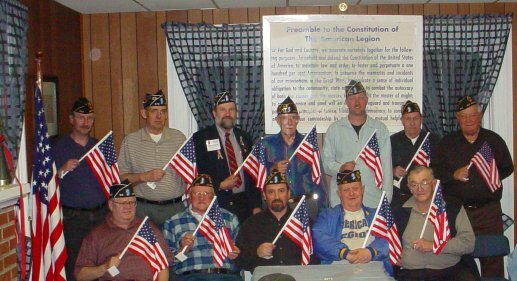 "A Gift from Norwich Wal-Mart....The Chenango County American Legion Accepted a Generous Gift of Mobile American Flags from the Norwich Wal-Mart As A Memoriam to Our Troops Overseas." 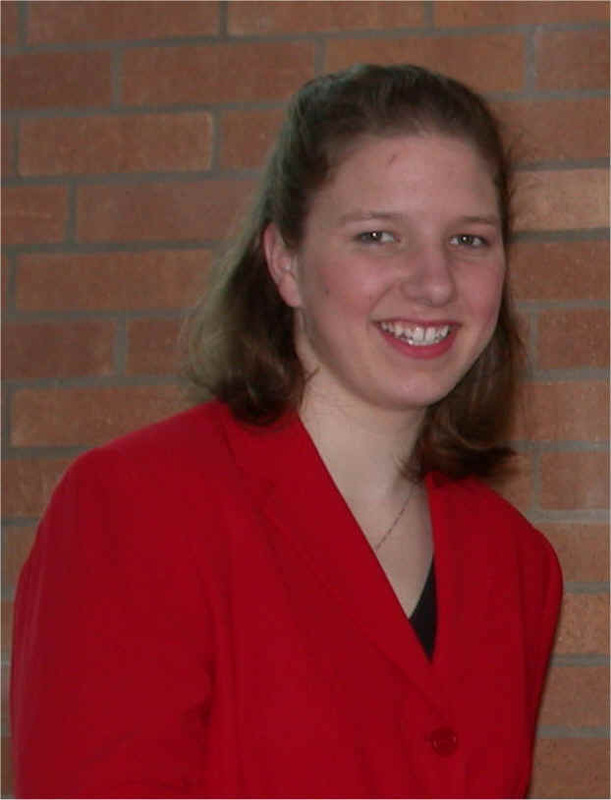 Oneida- A home-schooled high school senior from New Berlin captured a $1000 savings bond by placing in the American Legion Zone 4 Oratorical Contest Sunday at Oneida High School. 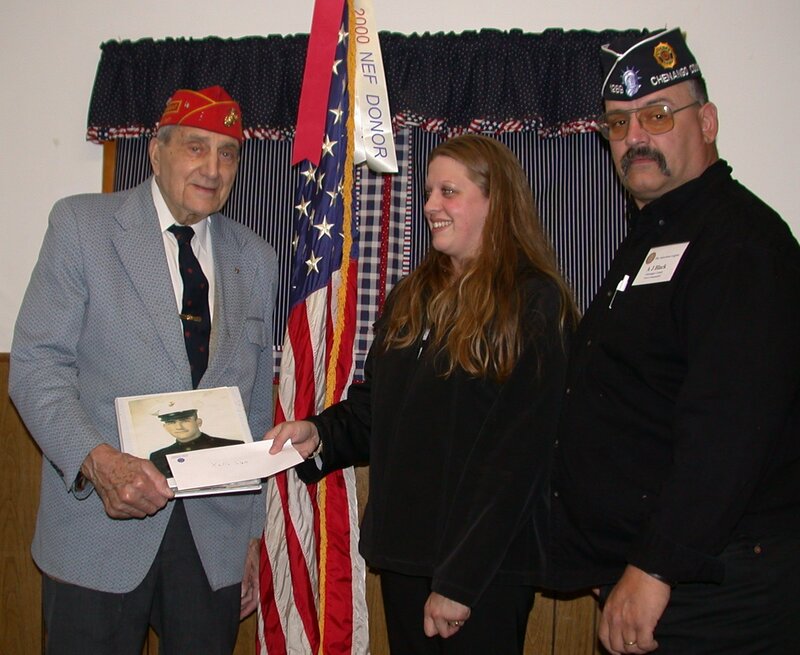 Margaret Newbold, daughter of Mark and Carolyn Newbold, had earlier won the Chenango County and District 6 competitions in the American Legion's major scholarship program. The oratorical contest involves writing and delivering an eight-to-ten minute speech on some aspect of the United States Constitution, and a three-to-five minute extemporaneous speech on some aspect of the Constitution which is not revealed until a few minute befores the competition begins. Miss Newbold, who is the reigning Chenango County Dairy Princess, has been augmenting her home schooling by taking courses at the State University College at Oneonta. She tentatively plans to major in Natural Resources at either Cornell or Purdue University. The American Legion is the world's largest organization of veterans of wartime military service, with nearly three million members. Eleven Chenango County posts have about 1,300 members. Miss Newbold was sponsored by Frank Arnold Post 348 of New Berlin. County Commander Fred Baker said the Constitutional basis of the oratorical contest is designed to lead students into a more intensive study of the United States Constitution than they normally get in school. 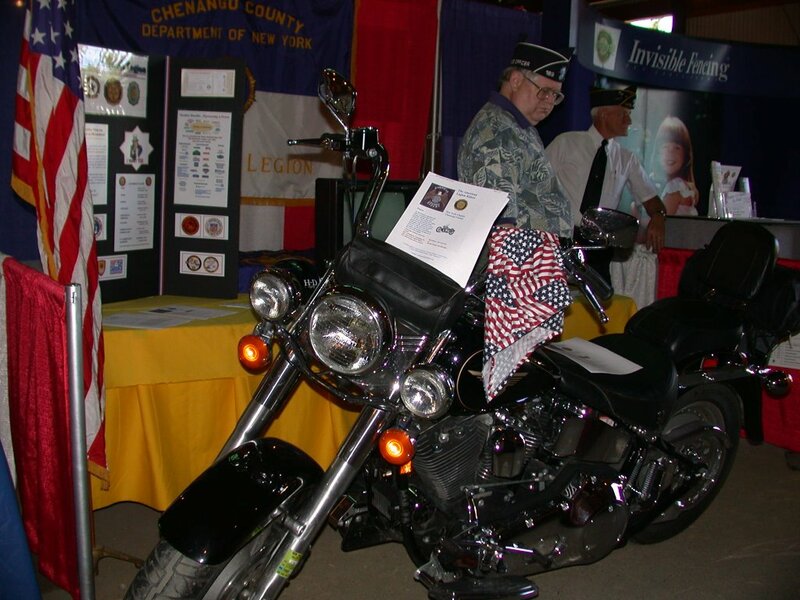 (Above) Members from posts in Chenango County American Legion took turns at the membership booth, that was setup at the Chenango County Fair. 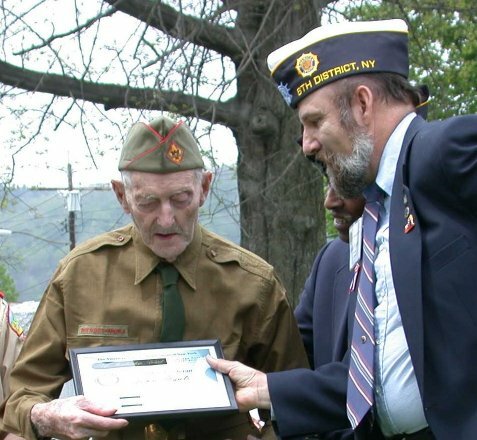 Chenango County Commander, Bradd Vickers (also 6th District Vice-Commander) presented The American Legion - Department of New York, Slater-Silvernail Post 806 Life Membership Award, to World War I veteran, John Hyatt, at the Memorial Day observance in Bainbridge. American Legion Commander Paul Russo’s last formal function as head of the 366-member Warren Eaton Post 189 - organizing Norwich’s Memorial Day program - was punctuated this morning by the presentation of a job-related award. Russo, 43, 7A Northrup Ave., received the American Legion 6th District Employment Representative of the Year award during ceremonies in West Side Park. Russo has been the local veterans’ employment representative for Chenango County for the past 10 years, and was nominated for the award by the Southern Tier Regional Office of the State Labor Department. The Labor Department’s Southern Tier region corresponds almost directly with the American Legion 6th District’s 10-county area. Russo received the award by 6th District American Legion Vice-Commander Bradd Vickers of South New Berlin Post 1289. State Veterans’ Counselor Terry Bresina, master of ceremonies for Monday’s program, emphasized that while the award was presented to Russo by friends, his selection was made by Labor Department managers. Bresina, Dept. 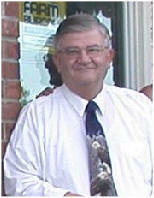 of New York Employment Chairman of the American Legion, said Russo also finished third among all the LVERs for the 2001 New York state award. Russo served in the U.S. Air Force from 1982-86 as an aircraft armament system specialist, servicing F-15 aircraft in Bitburg, Germany and F-16s at Shaw Air Force Base, S.C. He also served six years in the National Guard as an engineer with the 204th Engineers out of Binghamton’s West End Armory. He attended Westchester Community College for two years prior to enlistment, and he continued his education in the Air Force, emerging with a B.S. degree in Human Resource Management from St. Leo University. He is the only two-year commander in the 84-year-history of Lt. Warren Eaton Post 189 of the American Legion. In addition, he is active in the Big Brother Program and as a United Way volunteer. 6th District Spring Conference was held in Waverly, NY on April 28th. Oxford Fort Hill Post #376 Acquired a new Life Member at the American Legion Birthday Celebration March 16th, when Fred Foote of Oxford was presented an Honorary Life Membership by his Post. Bradd Vickers 6th District Vice Commander shakes hands with Ken Phillips, Oneida Nation Men's Council during recent visit to Oneida Indian Nation Veterans celebration. Also in photo are Rainy Collins-Vickers member of Auxiliary Unit 376 Oxford, and Chenango County Service Officer Terry Bresina. Breakfast is served almost every Sunday from 8-11am. 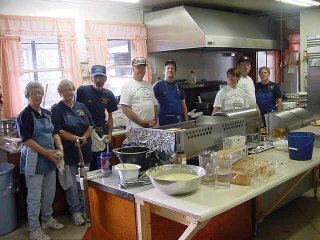 Six years of Community Breakfasts put on by the Fort Hill Post #376 American Legion, at Oxford, New York. Breakfast is served almost every Sunday from 8-11am. One week's breakfast netted a check for over $1,300, given to the American Red Cross for the "Twin Towers Relief Fund. The Post sponsors a troop of Boy Scouts and a troop of Cub Scouts, both of whom have attained District honors. These Scout Troops also donate time at the breakfasts serving tables. 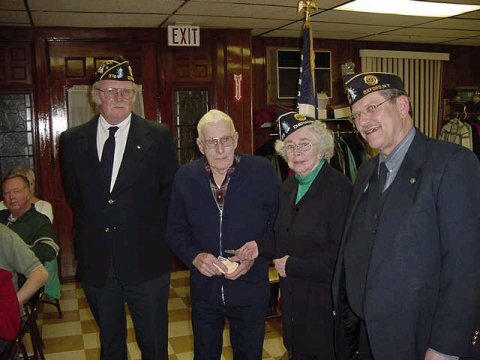 Funds attained by these Community Breakfasts are also used for Community Christmas parties, Thanksgiving baskets, and donations to the Volunteer Services of the New York State Veteran's Home at Oxford. Military Awards - Three members of Harold McIntyre Post 1289 of the American Legion display in front of the South New Berlin Firehouse the military awards and decorations they received on Memorial Day. 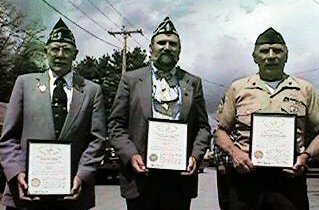 Memorial Day speaker Bradd Vickers, center, presented the New York State Medal of Merit to Donald J. Dibble, left, and the State Conspicuous Service Star to Harold Funke, right. Earlier Memorial Day morning, Vickers received the Medal for Merit and the Conspicuous Service Star at the Norwich Memorial Day program. The medals were secured by State Veteran Counselor Terry Bresina of Norwich.